We are a small Lincoln based company who specialise in all aspects of pipe organ work from tuning and maintenance to full restoration work. We are based in the Southern part of Lincoln on Skellingthorpe Road. 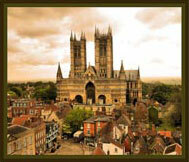 Lincoln is famous for it's historic buildings (Including Lincoln Cathedral pictured to the left) and its sausages. Lincoln is a growing city with more students attracted to the university each year and more people moving to the city because of its centralised location in England.